We developed a downpipe for the Golf 7 Euro 6 GTI Performance. The 4-cylinder 2.0 TSI is is supplied with a stock power of of 245 hp and 350 Nm of torque. 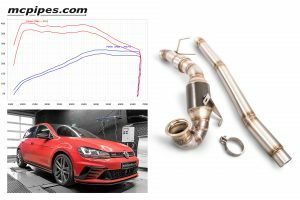 With our brand new in-house stainless steel downpipe with 200 cpi Kat, from our label mcpipes, the Golf 7 GTI now comes to an output of 268 hp and 403 Nm of torque. That makes a power increase of 23 hp and 53 Nm of torque – without chip tuning. 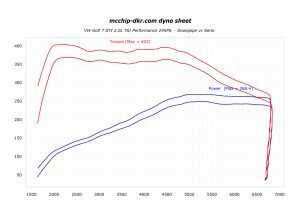 With chip tuning, the performance increases to whopping 310 hp and 445 Nm. Chiptuning and downpipe for the Golf 7 Euro 6 GTI Performance are now available in our shop.